SONDEE sobre el desarrollo temprano del lenguaje, incluso si las capacidades actuales parecen normales. ENFÓQUESE en puntos clave de la adquisición del lenguaje específica para la edad antes de la aparición de los síntomas manifiestos. HAGA PRUEBAS de la enfermedad CLN2 en niños que tienen estos dos síntomas característicos. Con base en información emergente, una prueba del desarrollo temprano del lenguaje antes de la aparición de convulsiones puede permitir un diagnóstico temprano de la enfermedad CLN2. 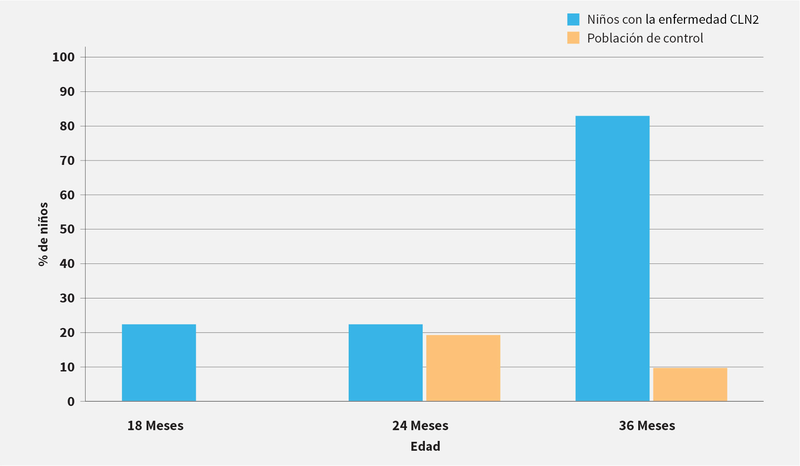 Una discusión sobre las primeras señales de la enfermedad CLN2 (convulsiones no provocadas de inicio reciente y retraso del lenguaje) y cómo un diagnóstico precoz puede beneficiar al niño y a su familia. Referencias: 1. Schulz A, Kohlschütter A, Mink J, Simonati A, Williams R. NCL diseases – clinical perspectives. Biochimica et Biophysica Acta. 2013;1832:1801-1806. 2. Mole SE, Williams RE, and Goebel HH. Correlations between genotype, ultrastructural morphology and clinical phenotype in the neuronal ceroid lipofuscinoses. Neurogenetics. 2005;6:107-126. 3. Pérez-Poyato MS, Marfa MP, Abizanda IF, et al. Late infantile neuronal ceroid lipofuscinosis: mutations in the CLN2 gene and clinical course in Spanish patients. J Child Neurol. 2013;28:470-478. 4. Williams RE, Adams HR, Blohm M, et al. Expert opinion on the management of CLN2 disease. Poster session presented at: The 12th Annual WORLD Symposium; February – March 2016; San Diego, CA. 5. Schulz A, Cohen-Pfeffer JL, Crystal R, et al. Neuronal ceroid lipofuscinosis-2 (CLN2) disorder, a type of Batten disease caused by TPP1 enzyme deficiency: current knowledge of the natural history from international experts. Poster session presented at: The Society for the Study of Inborn Errors of Metabolism (SSIEM) Annual Symposium; September 2015; Lyon, France. 6. Chang M, Cooper JD, Davidson BL, et al. CLN2. In: Mole S, Williams R, and Goebel H, eds. The neuronal ceroid lipofuscinoses (Batten Disease). 2nd ed. Oxford, United Kingdom: Oxford University Press; 2011:80-109. 7. Fietz M, Giugliani R, AlSayed M, et al. Expert recommendations for the laboratory diagnosis of neuronal ceroid lipofuscinosis type 2 (CLN2 disease): diagnostic algorithm and best practice guidelines for a timely diagnosis. Poster session presented at: The 12th Annual WORLD Symposium; February – March 2016; San Diego, CA. 8. Nickel M, Jacoby D, Lezius S, et al. Natural history of CLN2 disease: quantitative assessment of disease characteristics and rate of progression. Poster session presented at: The 12th Annual WORLD Symposium; February – March 2016; San Diego, CA. 9. Åndell E, Tomson T, Carlsson S, et al. The incidence of unprovoked seizures and occurrence of neurodevelopmental comordities in children at the time of their first epileptic seizure and during the subsequent six months. Epilepsy Res. 2015;113:140-150. 10. Worgall S, Sondhi D, Hackett NR, et al. Treatment of late infantile neuronal ceroid lipofuscinosis by CNS administration of a serotype 2 adeno-associated virus expressing CLN2 cDNA. Hum Gene Ther. 2008;19:463-474.